After Carbonite Safe Pro Users and Administrators have completed their registration, they can sign into their account and install Carbonite Safe Pro on their computer. 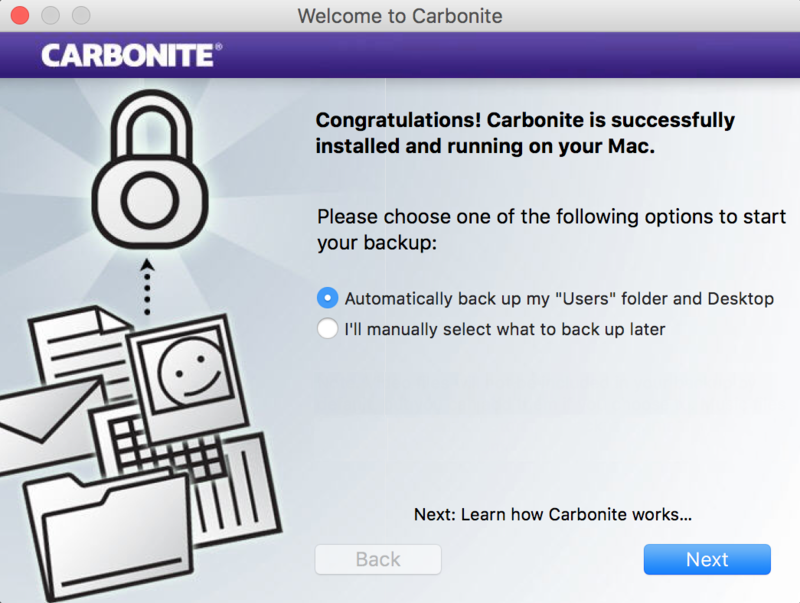 When installing Carbonite for the first time, you have the option to begin your backup with Automatic or Manual selections. To install Carbonite, sign into your Carbonite account as an administrator at https://account.carbonite.com. Once signed in, you will be at your company's Dashboard. Select Install on this computer from the Computer Actions drop-down menu. If you are an Administrator, please select your username from the Dashboard to access the area above. Click Download Now and follow the instructions to download and install Carbonite on your computer. If you try to run the file and get a message that the installation was blocked, please allow Carbonite through Gatekeeper for Carbonite to continue to install. On version 1.x, you can let Carbonite automatically select which folders and files to include in your backup or manually select which folders and files you wish included in your backup. After making your selection, click Next to finish the installation. Automatically back up my "Users" folder and Desktop - This option backs up your /Macintosh HD/Users folder, which holds your documents, pictures, music, and other important files that you may wish to back up. I'll manually select what to back up later - Nothing is automatically selected for back up when you choose this option. You will have to manually select the data you want to backup. With either choice, you can always add files, folders, and other internal hard drives to your backup through the Carbonite Preference pane. We recommend that you let Carbonite automatically manage your backup to ensure that your important data locations are selected for back up. If you have a paid subscription and have videos or other files that are not automatically included in your backup, Carbonite recommends that you manually select these files. With Carbonite 2.x, you can choose Automatic or Advanced Settings. After making your selection, click Install to finish the installation. 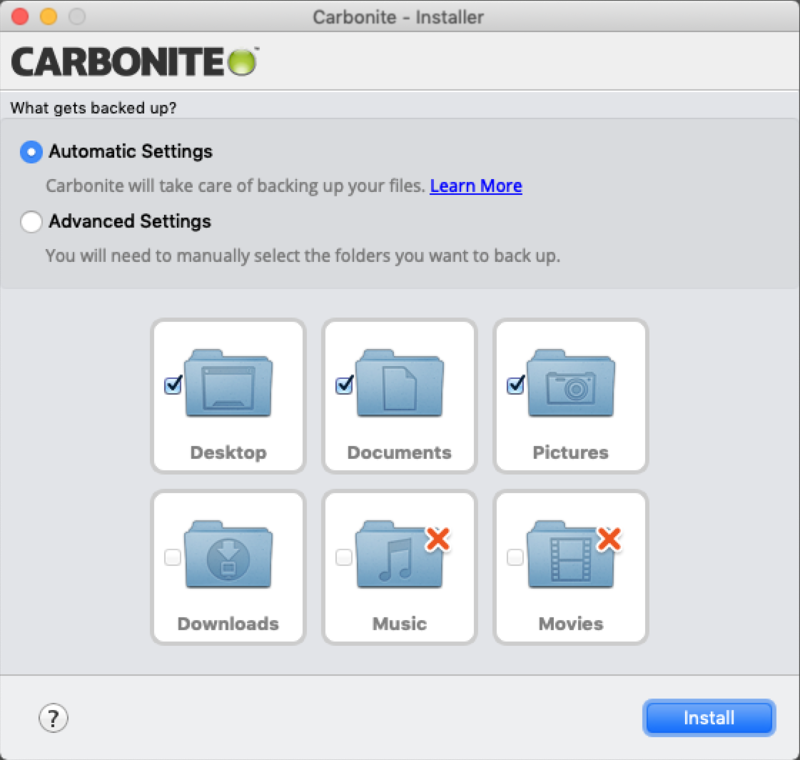 Automatic Settings selects Carbonite’s recommended user files and folders for back up. Advanced Settings does not select anything for backup. You will need to manually select the files and folders you wish to back up. Desktop - This option selects your Desktop folder to be included in your backup. Documents - This option will select your Documents folder to be included in your backup. Pictures - This option includes your Pictures folder to be included in your backup. Downloads - This option selects your Downloads folder to be included in your backup. Music - This option selects your Music folder to be included in your backup. During a trial, your music files are not backed up automatically. However, you can select them manually. Movies - This option selects your Movies folder to be included in your backup. During a trial, your video files are not backed up automatically. However, you can select them manually. You can always add files or folders to be included in your backup through the Carbonite User Interface. If you have a paid subscription and have videos or other files that are not automatically included in your backup, Carbonite recommends that you manually select these files. Files in the Library location must also be manually selected for backup.